Gaining insights into the regulatory mechanisms that underlie the transcriptional variation observed between individual cells necessitates the development of methods that measure chromatin organization in single cells. Here I adapted Nucleosome Occupancy and Methylome-sequencing (NOMe-seq) to measure chromatin accessibility and endogenous DNA methylation in single cells (scNOMe-seq). scNOMe-seq recovered characteristic accessibility and DNA methylation patterns at DNase hypersensitive sites (DHSs). An advantage of scNOMe-seq is that sequencing reads are sampled independently of the accessibility measurement. scNOMe-seq therefore controlled for fragment loss, which enabled direct estimation of the fraction of accessible DHSs within individual cells. In addition, scNOMe-seq provided high resolution of chromatin accessibility within individual loci which was exploited to detect footprints of CTCF binding events and to estimate the average nucleosome phasing distances in single cells. scNOMe-seq is therefore well-suited to characterize the chromatin organization of single cells in heterogeneous cellular mixtures. DNA contains all the information and instructions needed to build an organism and enables its cells to fulfil their role. There are many different cell types in animals, and each type only needs a small portion of the information found in the DNA to do its job. Hence, only the sections – also known as genes – specific to a particular role need to be active or ‘expressed’ in any given cell type. The sets of genes that are active in a cell determine what that cell can do and make it different from other cell types. Short regions that surround the genes act as ‘switches’ to control their activity. To study how these switches work, researchers have developed techniques that can measure when specific ones are on or off in different cell types. A technique called NOMe-seq can simultaneously identify active and inactive regions in the genome by measuring markers that are specific for active and inactive regions. However, this approach was created for large samples containing thousands of cells, so-called bulk samples. Since the pattern of gene expression can vary between individual cells even if they are of the same cell type, it is important to analyse each individual cell. Sebastian Pott has now adapted the NOMe-seq technique for use in single cells. The modified protocol was used to study human cells that have been well studied and can be grown in the laboratory. The results of this proof-of-principle study showed that the adapted version of the technique obtained similar results as when used on bulk samples. This demonstrates that the method can reliably measure active and inactive regions in single cells across the genome. The next step will be to use this tool to study how genes are affected in diseases like cancer, where gene expression can be variable between individual cells. For example, understanding the differences between individual cells within a cancer sample might help to understand why some cancers react to treatments better than others. Extensive transcriptional variation between individual cells has been observed using single cell RNA-seq. These data facilitate identification of functional subpopulations in seemingly homogeneous cell populations (Shalek et al., 2014), or characterization of the cellular composition of complex tissues (Jaitin et al., 2014; Treutlein et al., 2014; Macosko et al., 2015). To gain mechanistic insights into regulatory features that underlie cellular heterogeneity it is essential to measure chromatin organization in individual cells. A number of methods that map chromatin organization in populations of cells have been adapted for single cells, including ATAC-seq (Cusanovich et al., 2015; Buenrostro et al., 2015b), DNase-seq (Jin et al., 2015), methylome sequencing (Smallwood et al., 2014; Farlik et al., 2015), and ChIP-seq (Rotem et al., 2015). Interpretation of these data in single cells is complicated because of the near binary and extremely sparse signal (Cusanovich et al., 2015; Buenrostro et al., 2015b; Maurano and Stamatoyannopoulos, 2015). Nucleosome Occupancy and Methylome-sequencing (NOMe-seq) (Kelly et al., 2012) employs the GpC methyltransferase (MTase) from M.CviPI to probe chromatin accessibility (Kelly et al., 2012; Kilgore et al., 2007). The GpC MTase methylates cytosines in GpC dinucleotides in non-nucleosomal DNA in vitro. Combined with high-throughput bisulfite sequencing this approach has been used to characterize nucleosome positioning and endogenous methylation in human cell lines (Kelly et al., 2012; Taberlay et al., 2014) and in selected promoters of single yeast cells (Small et al., 2014). NOMe-seq data have several unique features that are advantageous considering the challenges associated with single cell measurements (Figure 1a). First, NOMe-seq simultaneously measures chromatin accessibility (through GpC methylation) and endogenous CpG methylation. Chromatin accessibility indicates whether a putative regulatory region might be utilized in a given cell (ENCODE Project Consortium, 2012), while endogenous DNA methylation in regulatory regions has been connected to a variety of regulatory processes often associated with repression (Schübeler, 2015). The ability to combine complementary assays within single cells is essential for a comprehensive genomic characterization of individual cells since each cell represents a unique biological sample which is almost inevitably destroyed in the process of the measurement. Second, each sequenced read might contain several GpCs which independently report the accessibility status along the length of that read. NOMe-seq therefore captures additional information compared to purely count-based methods, such as ATAC-seq and DNase-seq, which increases the confidence associated with the measurements and allows detection of footprints of individual transcription factor (TF) binding events in single cells. Third, the DNA is recovered and sequenced independently of its methylation status, which is a pre-requisite to distinguish between true negatives (i.e. closed chromatin) and false negatives (i.e. loss of DNA) when assessing accessibility at specified locations in single cells. This is especially important in single cells where allelic drop-out is pervasive. In single cells, NOMe-seq can therefore measure the fraction of accessible regions among a set of covered, pre-defined genomic locations. In this proof- of-principle study, I showed that NOMe-seq, which previously had only been performed on bulk samples (Kelly et al., 2012; Taberlay et al., 2014), can be performed on single cells. In addition to endogenous methylation at CpG dinucleotides, single cell NOMe-seq (scNOMe-seq) measured chromatin accessibility at DHSs and TF binding sites in individual cells, and detected footprints of CTCF binding at individual loci. Finally, the average phasing distance between nucleosomes within individual cells can also be estimated from scNOMe-seq data. (a) Schematic of GpC methyltransferase-based mapping of chromatin accessibility and simultaneous detection of endogenous DNA methylation. (b) Schematic of scNOMe-seq procedure introduced in this study. To adapt the NOMe-seq protocol (Kelly et al., 2012; Miranda et al., 2010) to single cells, individual nuclei were first incubated with GpC MTase and then sorted into wells of a 96-well plate using fluorescence-activated cell sorting (FACS) (Figure 1b and Figure 1—figure supplement 1). DNA from isolated nuclei was subjected to bisulfite conversion and sequencing libraries were prepared using a commercial kit for amplification of low amounts of bisulfite-converted DNA (Materials and methods). To assess the feasibility and performance of NOMe-seq in single cells, I used the well-characterized cell lines GM12878 and K562. The scNOMe-seq datasets in this study represent 19 individual GM12878 cells and 11 individual K562 cells. The set of GM12878 cells included seven control cells that were not treated with GpC MTase (Figure 1—figure supplement 2). Each GpC MTase-treated library was sequenced to at least 16 M individual reads (Materials and methods). Reads were aligned to the human genome using the aligner Bismark (Krueger et al., 2012) and, after removal of duplicate reads, between 2.5M and 5M reads were retained per library (Supplementary file 1). On average 6,679,864 (2.9%) of all cytosines in GpCs and 1,291,180 (3.6%) of all cytosines in CpGs were covered per cell (Figure 2—figure supplement 1 and Supplementary file 1). To test whether the GpC methylation observed in GpC MTase treated samples (Figure 2—figure supplement 1) captured known chromatin accessibility patterns, I focused on DNaseI hypersensitive sites (DHSs) that were previously identified in GM12878 and K562 cell lines (ENCODE Project Consortium, 2012). DHSs were associated with strong enrichment of GpC methylation, both in data from pooled and individual GM12878 (Figure 2a,b, Figure 2—figure supplement 2) and K562 cells (Figure 2—figure supplements 3 and 4). Conversely, endogenous CpG methylation decreased around the center of the DHSs in agreement with previous reports (Stadler et al., 2011; Ziller et al., 2015) (Figure 2a and Figure 2—figure supplement 3). These data show that scNOMe-seq detected chromatin accessibility at DHSs. To assess how many of the known DHSs regions were recovered in a single cell, I first filtered DHSs that contained GpC dinucleotides within their primary sequence and thus could be theoretically detected by NOMe-seq. The frequent occurrence of GpC di-nucleotides renders the majority (>85%) of DHSs detectable by NOMe-seq (Figure 2—figure supplements 5 and 6). Of the theoretically detectable DHSs, 10.6% (20388/191566) and 17.3% (33182/191598) had one or more GpCs covered and, using a more stringent criterion, 5.2% (9083/174896) and 9.5% (16608/174828) were covered at four or more GpCs in individual GM12878 cells and K562 cells, respectively (Figure 2c). Chromatin accessibility signal can vary along the length of a given DHSs due to binding of transcription factors (Neph et al., 2012) and the specific position of a GpC within a DHS will thus affect its chance of being methylated. To account for this variability and to obtain more robust estimates of GpC methylation only DHSs with at least four covered GpC were used for the subsequent analyses and referred to as ‘covered DHSs’. scNOMe-seq data reveal how accessibility in single cells underlies observed DNaseI hypersensitivity in a population of cells. (a) Average GpC methylation level (blue) and CpG methylation level (orange) at DHSs in GM12878 cells. Regions are centered on the middle of DNase-seq peak locations. Shown is the average methylation across a 2 kb window of 12 GM12878 cells. (b) Heatmap displaying the average GpC methylation level across the same regions as in a). Each row corresponds to an individual GM12878 cell. Cells were grouped by similarity. (c) Proportion of DHSs covered by scNOMe-seq sequencing reads in each cell. The proportion displayed corresponds to the fraction of DHSs covered by at least 1 or 4 GpCs in a given cell. Only DHSs with at least 1 GpC (red) or 4 GpCs (cyan) within their primary sequence were taken in consideration. Error bars represent standard deviation. (d) Average GpC methylation at DHSs grouped into quartiles based on associated DNase-seq peak scores from lowest to highest scores. ‘Shuffled’ represents methylation data in genomic regions obtained by random placements of DHS peak intervals. Data shown are from GM12878 cells. (e) Fraction of accessible sites in individual GM12878 cells (red) and K562 cells (cyan). Shown are the means and standard deviation based on all cells. (f) Scatter plot showing relationship between GpC methylation levels and DHS peaks score for each covered DHS. Plot shows data from all individual GM12878 cells. Red trend line is shown to visualize the relationship between GpC methylation and endogenous CpG methylation. (g) Scatter plot showing relationship between CpG methylation levels and DHS peaks score for each covered DHS. Plot shows data from all individual GM12878 cells. Red trend line is shown to visualize the relationship between CpG methylation and peak scores. (h) Plot illustrates the relationship between endogenous CpG methylation and GpC methylation at DHS loci. Plot shows combined data from all GM12878 cells. Correlation was calculated based on Pearson correlation (r = −0.13) i) Average CpG methylation at DHS loci grouped based on GpC scores within single cells. Each dot represents the average CpG methylation level for a single cell. In single cells, the average GpC methylation at covered DHSs was strongly correlated with the observed DNaseI accessibility at these sites in bulk populations (Figure 2d, Figure 2—figure supplements 7 and 8). The opposite trend was observed for endogenous CpG methylation which was lowest for DHSs with the highest DNaseI accessibility (Figure 2—figure supplement 7). The correlation between GpC methylation and DNaseI accessibility was lower for scNOMe-seq data compared to bulk NOMe-seq data in the same cell line (Figure 2—figure supplement 8). At the level of individual sites the distribution of GpC methylation suggested that around 50% of the covered DHS showed less than 25% GpC methylation in individual cells (Figure 2—figure supplement 9). To estimate the proportion of covered DHSs that were concurrently accessible in a single cell I applied a fixed threshold of 40% GpC methylation above which sites were considered accessible (Materials and methods). At this GpC methylation threshold 32–44% and 26–37% of all covered DHSs were determined to be accessible in single GM12878 and K562 cells, respectively. As expected these results depended to some degree on the cutoffs used for GpC methylation and the number of required GpCs per DHS. However, even under the most lenient conditions less than 50% of DHSs were accessible in individual cells (Figure 2—figure supplement 10). Grouping the DHSs based on DNaseI accessibility in bulk samples, confirmed that the degree of DNaseI accessibility related closely to the frequency of DHS accessibility in single cells (Figure 2e). This analysis leveraged the NOMe-seq-specific property that the DNA sequence is recovered independently of its accessibility status. It provided direct evidence for the notion that the degree of DNaseI accessibility observed in DNase-seq of bulk samples reflects the frequency with which a region is accessible in individual cells. Consequently, chromatin accessibility between cells is less variable at regions with high DNaseI accessibility in bulk samples (Figure 2—figure supplement 11). Correspondingly, correlation of GpC methylation between individual cells is stronger at DHS loci compared to randomized locations (Figure 2—figure supplement 12). Chromatin accessibility and endogenous methylation show characteristic patterns at gene promoters and within gene bodies (Schübeler, 2015; ENCODE Project Consortium, 2012). To test whether these features can be observed in scNOMe-seq data, I first plotted the average GpC and CpG methylation around transcription start sites (TSS). The average GpC methylation showed the expected increase of chromatin accessibility directly upstream of the TSS (Figure 3a, Figure 3—figure supplement 1). In contrast, and as expected, the endogenous CpG methylation decreased towards the TSS (Figure 3b). To visualize the distribution of CpG methylation throughout entire gene loci, I plotted the aggregated CpG methylation across regions containing the entire gene body and 50 kb upstream and 50 kb downstream of each gene (Figure 3c, Figure 3—figure supplement 1). Endogenous methylation was specifically reduced at the narrow promoter region and gradually increased throughout the gene body. Downstream of the transcription end site (TES) the average level CpG methylation level fell back to the non-genic background level. Endogenous CpG methylation is typically increased within highly expressed genes (Schübeler, 2015). This trend was clearly apparent in the single cell data where gene body methylation was highest in highly expressed genes (Figure 3d, Figure 3—figure supplement 1). Correspondingly, in promoter regions (−500 bp to +150 bp) chromatin accessibility (GpC methylation) increased with the transcript level of the adjacent gene (Figure 3e, Figure 3—figure supplement 2). In contrast to chromatin accessibility, endogenous methylation was lowest in promoters of genes with high transcript levels (Figure 3f). These data show that scNOMe-seq recapitulated known characteristics of chromatin accessibility and endogenous methylation at gene promoters and within gene bodies. Single cell NOMe-seq reveals chromatin features closely linked to gene expression. (a) Average GpC methylation level at TSS in GM12878 cells. Regions are centered on the TSS locations. Shown is the average methylation across a 2 kb window of 12 GM12878 cells. (b) Same as in a) but displaying the endogenous CpG methylation level. (C) Average endogenous CpG methylation at gene loci in individual GM12878 cells. Shown is the average methylation across gene bodies (represented as meta genes) and 50 kb regions upstream and downstream of each gene. Each line represents the aggregated CpG methylation data for a single GM12878 cell (TES: transcription end site). (d) Boxplot displays average CpG methylation in gene bodies. 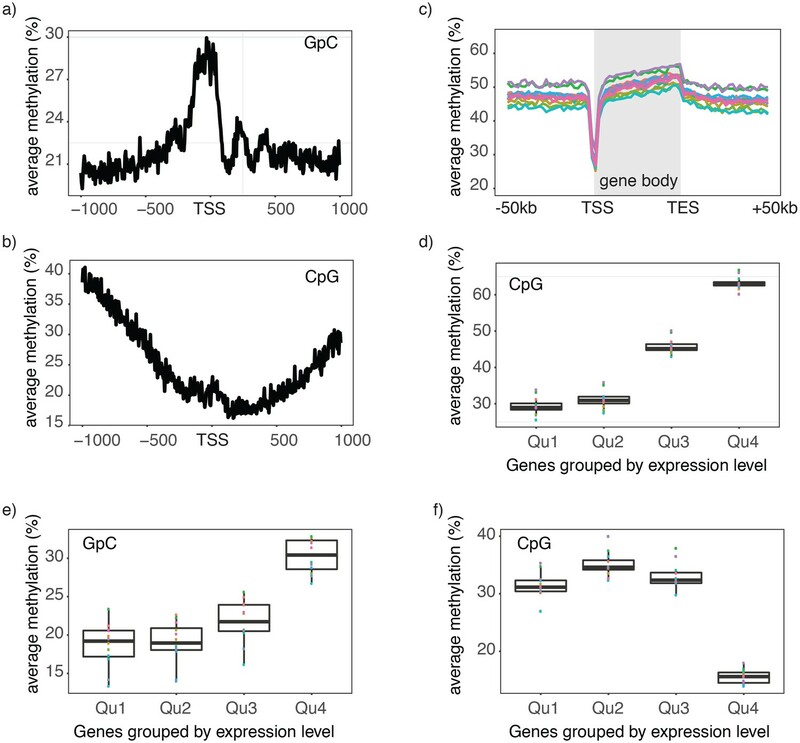 Genes were grouped into quartiles based on their transcript levels in bulk. Dots represent the average CpG methylation value for individual cells. (e) Boxplot displays average GpC methylation in promoter regions (−500 bp to +150 bp). Genes were grouped into quartiles based on their transcript levels in bulk. (f) Similar to (e) but displayed are the levels of endogenous CpG methylation. A potentially powerful application for single cell genomic approaches is the label-free classification of single cells from heterogeneous mixtures of cells solely based on the measured feature (Cusanovich et al., 2015; Buenrostro et al., 2015a; Jaitin et al., 2014; Macosko et al., 2015). Of note, using a union set of DHSs from both cell types was sufficient to classify individual GM12878 and K562 cells into their respective cell types based on GpC methylation (Figure 4a, Figure 4—figure supplement 1). While this assessment might have been influenced in part by the separate processing of the cell types, both cell types showed preferential enrichment of GpC methylation at their respective DHSs compared to DHSs identified in the other cell type (Figure 4b). Similar to GpC methylation, endogenous CpG methylation at multiple sets of genomic features was sufficient to separate the cells into the respective cell types (Figure 4c, Figure 4—figure supplement 1). single cell GpC and CpG methylation signal is sufficient to group GM12878 and K562 cells according to their origin. 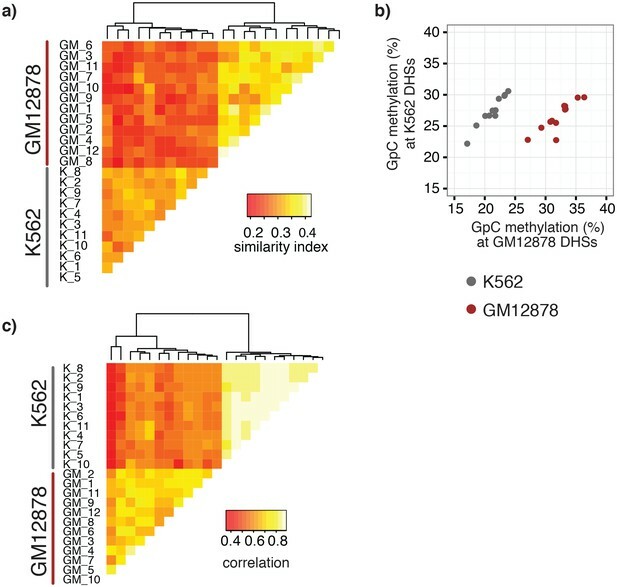 (a) Heatmap shows similarity scores (pair-wise Jaccard distances) for accessibility between all GM12878 and K562 cells measured on the union set of DHSs from GM12878 and K562 cells. Cells were grouped based on unsupervised hierarchical clustering. (b) Average GpC methylation at the DHSs from GM12878 cells and K562 cells, respectively, was calculated for all individual GM12878 and K562 cells. The resulting two values for GpC methylation are displayed for each cell. While the average methylation levels at K562 DHSs for both cell types appear similar, GM12878 and K562 are separable based on these data when accounting for different levels of genome-wide GpC methylation in GM12878 and K562 cells. Importantly, for cells from either cell type the methylation levels are higher in the DHSs of the cell type of origin than in the DHSs of the other cell type. (c) Heatmap shows correlation coefficients between all GM12878 and K562 cells for pair-wise comparison of CpG methylation levels. Genome was divided into 10 kb bins and only bins with sufficient coverage in both cells were used for a given pair (> = 20 covered CpGs). Cells were grouped based on unsupervised hierarchical clustering. To examine in detail whether scNOMe-seq captures features of chromatin accessibility that are specifically associated with transcription factor binding, I analyzed scNOMe-seq data at transcription factor binding sites (TFBS). The average GpC methylation around CTCF ChIP-seq peaks (ENCODE Project Consortium, 2012) in single cells recapitulated the accessibility previously observed in NOMe-seq bulk samples (Kelly et al., 2012): Accessibility increased strongly towards the CTCF binding sites while the location of the CTCF motif at the center of the region showed low accessibility suggesting that CTCF binding protected from GpC MTase activity and thus creating a footprint of a CTCF binding event, both when averaged across data from all single cells (Figure 5a and Figure 5—figure supplement 1) and in individual cells (Figure 5b and Figure 5—figure supplement 2). In contrast, endogenous CpG methylation was generally depleted around the center of CTCF binding sites (Figure 5a and Figure 5—figure supplement 1). Similar accessibility profiles, albeit less pronounced compared to CTCF, were observed for additional transcription factors, for example EBF1 and PU.1 (Figure 5—figure supplement 3). These analyses provided evidence that, in aggregate, scNOMe-seq detected chromatin accessibility characteristic of CTCF binding in single cells. 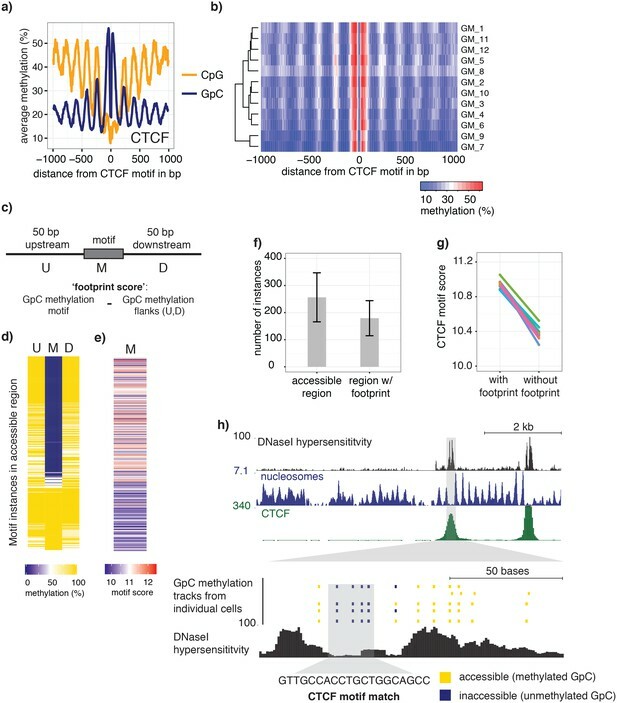 To test whether scNOME-seq data detected CTCF footprints at individual motifs loci, GpC methylation at motifs within CTCF ChIP-seq peaks was compared to the GpC methylation level in the regions flanking each motif (Figure 5c). On average, two-thirds of CTCF motif instances within these accessible regions showed no GpC methylation, suggesting that CTCF binding prevented the GpC MTase from methylating the cytosines within the binding motif and thus creating a footprint (Figure 5d and f). Of note, motifs associated with a footprint had significantly higher scores than motifs without a footprint suggesting that the motif score is a strong determinant of CTCF binding within these accessible regions (p= 5.429e-12, paired t-test) (Figure 5e,g and Figure 5—figure supplement 4). Of note, the CTCF footprints could be observed at individual loci within individual cells and were shared across cells (Figure 5h and Figure 5—figure supplement 5). scNOMe-seq detected characteristic accessibility patterns at CTCF transcription factor binding sites and measured CTCF footprints at individual loci. (a) Average GpC methylation level (blue) and CpG methylation level (orange) at CTCF binding sites in GM12878 cells. Regions are centered on motif locations. Shown is the average methylation across a 2 kb window of the pool of 12 GM12878 cells. (b) Heatmap displaying the average GpC methylation across CTCF binding sites. Each row corresponds to an individual GM12878 cell and rows are grouped by similarity. (c) Schematic outline the measurement of CTCF footprints in accessible regions. M denotes CTCF binding motifs within CTCF ChIP-seq regions and U and D indicate 50 bp upstream and downstream flanking regions. footprint score was determined by subtracting the average GpC methylation in the flanking regions from the GpC methylation at the motif. (d) Heatmap displays GpC methylation in accessible regions found in a representative GM12878 cell (GM_1). Each row represents a single CTCF motif instance within a CTCF ChIP-seq region. Average methylation values for the motif and the 50 bp upstream and downstream regions are shown separately. Regions are sorted based on the footprint score. Displayed are only regions that had sufficient GpC coverage and that were considered accessible based on the methylation status of the flanking regions. (e) Heatmap reporting the CTCF motif scores for the motif regions in (d). Regions are sorted in the same order as in (d). (f) Average number of accessible regions at CTCF motifs and the average number of those with a detectable footprint per individual GM12878 cell. Error bars reflect standard deviation. (g) Average CTCF motif scores in regions with and without CTCF footprint for all 12 GM12878 cells. Each line connects the two data points from an individual cell. Regions with footprint are associated with higher motif scores (p= 5.429e-12, paired t-test). (h) Combined display of scNOMe-seq data from this study and DNase hypersensitivity data, nucleosome occupancy, and CTCF ChIP-seq data from ENCODE. Upper panel shows a ~10 kb region containing a CTCF binding site. DNaseI hypersensitivity data and nucleosome density show characteristic distribution around CTCF binding sites in GM12878 cells. Lower panel shows the GpC methylation data of 5 individual cells that had sequencing coverage in this region, 4 of the cells provide GpC data covering the CTCF motif located in the region. scNOMe-seq data tracks show methylation status of individual GpCs. Each row corresponds to data from a single cell. These data indicate that binding of CTCF is detected in all 4 cells. Data are displayed as tracks in the UCSC genome browser (http://genome.ucsc.edu). The pattern of GpC methylation adjacent to CTCF sites suggested that scNOMe-seq also detected the well-positioned nucleosomes flanking these regions (Figure 5a) (Kelly et al., 2012). This observation was confirmed by the oscillatory distribution of the average GpC and CpG methylation around locations of well-positioned nucleosomes identified from MNase-seq data (ENCODE Project Consortium, 2012) (Figure 6a). While nucleosome core particles are invariably associated with DNA fragments of 147 bp, nucleosomes are separated by linker DNA of varying lengths, resulting in different packaging densities between cell types and between genomic regions within a cell (Valouev et al., 2011; Schones et al., 2008). To determine whether scNOMe-seq data can be used to measure the average linker length, average distances between nucleosome midpoints in single cells (phasing distances) were estimated by correlating the methylation status between pairs of cytosines in GpC di-nucleotides at offset distances from 3 bp to 400 bp (Figure 6c,d and Figure 6—figure supplements 1 and 2). The estimated phases fell between 187 bp and 196 bp (mean = 196.7 bp) in GM12878 cells, and between 188 bp and 200 bp (mean = 194.2 bp) in K562 cells (Figure 6e). These estimates are in general agreement with phase estimates derived from MNase-seq data in human cells (Valouev et al., 2011). In addition, estimated phasing distances varied within individual cells depending on the chromatin context, similar to observation from bulk MNase-seq data (Valouev et al., 2011) (Figure 6f). Nucleosome phasing in single cells. (a) Average GpC methylation level and (b) CpG methylation level at well-positioned nucleosomes in GM12878 cells. Regions are centered on midpoints of top 5% of positioned nucleosomes. Shown is the average methylation across a 2 kb window of the pool of 12 GM12878 cells. (c), (d) Correlation coefficients for the comparison in methylation status between GpCs separated by different offset distances for GM12878 (c) and K562 (d) cells. Each line represents a single cell. Data are smoothened for better visualization. (e) Distribution of estimated phase lengths for GM12878 and K562 cells. (f) Nucleosome phasing in GM12878 in genomic regions associated with different chromatin states defined by chromHMM (ENCODE). Boxplot represents the distribution of estimated phase lengths from all 12 GM12878 cells and overlaid points indicate values of each individual cells. In this study, I demonstrated that scNOMe-seq simultaneously measures chromatin accessibility by GpC methylation as well as endogenous CpG and DNA methylation in single cells. scNOMe-seq detected chromatin accessibility at DHSs and TFBS and, in aggregate, these data recapitulated NOMe-seq data obtained from bulk cells (Kelly et al., 2012). scNOMe-seq data also detected footprints of CTCF binding, and was used to estimate nucleosome phasing distances. Similar to other single cell genomic methods, scNOMe-seq relies on annotations obtained from bulk measurements (Cusanovich et al., 2015; Buenrostro et al., 2015b; Smallwood et al., 2014; Farlik et al., 2015). A limitation of single cell genomic methods is their sparse coverage which leads to high allelic drop-out. For methods in which the signal is based on counting the sequenced fragments, such as ATAC-seq and DNase-seq, this poses a challenge since true negatives at a specific location cannot be distinguished from false negatives that are a consequence of read loss. Compared to these methods, scNOMe-seq has the unique advantage, that reads are recovered independently of the signal and allelic drop-out events therefore can be distinguished from closed or inaccessible chromatin configurations. The frequency of accessible sites in the population of DHSs can be estimated. Using this approach only about 30–50% of DHSs detected in the population were found accessible in a single cell, depending on the thresholds chosen to call a site accessible. While this assessment would have been possible using bulk NOMe-seq data, scNOMe-seq offers important possibilities for future applications. For example, to compare accessibility across multiple loci within a single cell and the use of heterogeneous cellular mixtures as input material. 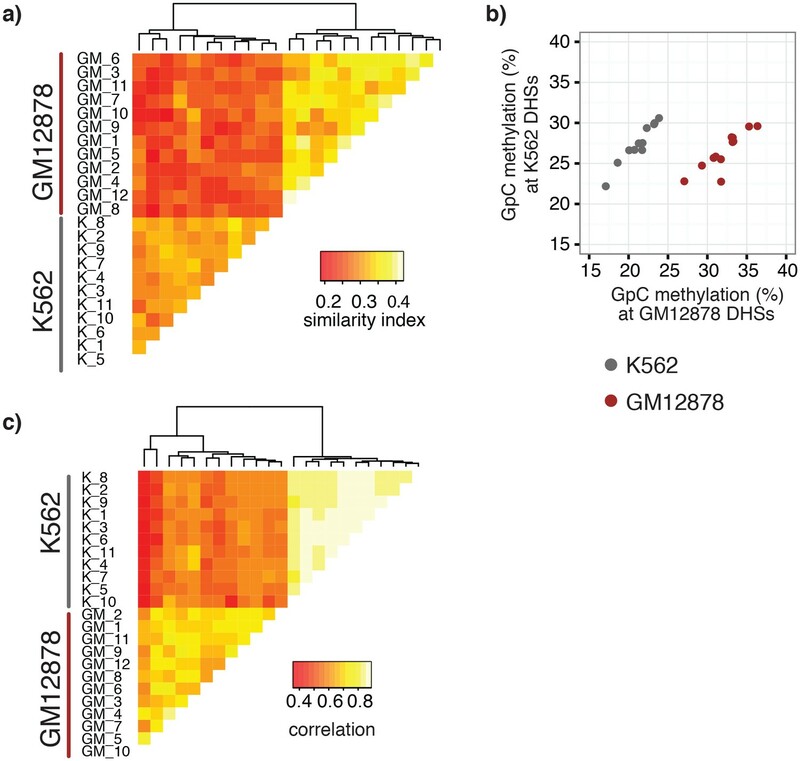 Measuring similarity of chromatin accessibility between cells was sufficient to group GM12878 and K562 cells based on their cell type of origin (Figure 3a). In this particular case, the separation is confounded with experimental batches. However, higher average GpC methylation in DHSs for the respective cell type compared to the DHSs of the other cell type indicated that scNOMe-seq can differentiate the two cell types (Figure 2—figure supplement 14). Similarly, endogenous CpG methylation at different genomic features (DHS, 10 kb windows, gene bodies) was sufficient to distinguish between the two cell types. This approach should be extendable to scNOMe-seq data from samples containing mixtures of cell types. scNOMe-seq measures chromatin accessibility at GpC di-nucleotides along the entire length of a sequencing read. Since most features that bind DNA are smaller than the length of 100 bp (200 bp within 200–500 bp regions in the case of paired end reads), the regions covered by sequence-specific transcription factors and nucleosomes can be captured within a single fragment. This allows one to directly detect binding of TFs provided that their sequencing motif contains at least one GpC di-nucleotide. I demonstrated the feasibility of this approach using CTCF binding sites. Of note, most motifs within regions of CTCF ChIP-seq peaks were protected from GpC methylation (‘footprint’) (Figure 5). In agreement with an inferred binding event as the cause for this protection, scores for CTCF motifs that were associated with a footprint were significantly higher than for motifs without a footprint. Depending on the motif specificity of a given TF and provided that their motifs contain a GpC dinucleotide, similar measurements should be feasible for many TFs and could be used to infer the activity of a range of transcription factors in single cells or to measure combinatorial binding of two or more TFs. Estimation of the average nucleosome phasing distances allows one to study chromatin compaction and complements the measurements of chromatin accessibility at regulatory regions and DNA methylation. The estimates from individual cells fit very well with measurements made from MNase-seq data in bulk samples (Valouev et al., 2011). It remains to be established whether the variation in phasing distances between individual cells is of biological or technical nature (Figure 6e). These proof-of-principle experiments have been performed using commercial kits for bisulfite conversion and library amplification, additional optimization or alternative amplification approaches (Smallwood et al., 2014) are likely to increase the yield substantially. Compared to other single cell methods, for example ATAC-seq, scNOMe-seq does not enrich for accessible chromatin regions and thus requires significantly more sequencing coverage. Ultimately, it should be possible to integrate the GpC MTase treatment into microfluidic workflows and combine this method with scRNA-seq, similar to recently published methods that combine scRNA-seq and methylome- sequencing (Angermueller et al., 2016). This study was primarily designed to test the feasibility of NOMe-seq in single cells and only a small number of nuclei where sequenced for each cell line. As a consequence, this set up could not be used to study cell-to-cell variation in detail. scNOMe-seq will be particularly useful for studies that aim to simultaneously measure chromatin accessibility and DNA methylation. This approach will be especially powerful for the characterization of chromatin organization in single cells from heterogeneous mixtures or complex tissues, for example to samples of brain tissues or primary cancer cells. GM12878 (RRID:CVCL_7526) and K562 (RRID:CVCL_0004) cells were obtained directly from Coriell and ATCC, respectively. No further confirmation of the authenticity of these cell lines or mycoplasma testing has been performed. GM12878 were grown in RPMI medium 1640 (Gibco), supplemented with 2 mM L-Glutamine (Gibco), and Penicilin and Streptavidin (Pen Strep, Gibco), and 15% fetal bovine serum (FBS, Gibco). K562 were grown in RPMI medium 1640 of the same composition but with 10% FBS. Cells were grown at 37 C and in 5% CO2. NOMe-Seq procedure was performed based on protocols for CpG methyltransferase M.SSsI described in Miranda et al. (2010) and the GpC methyltransferase from M.CviPI (Kelly et al., 2012), with some modification. Between 2 × 10^6 and 5 × 10∧6 cells were harvested by centrifuging the cell suspension for 5 min at 500x g. Cells were washed once with 1x PBS, re-suspended in 1 ml lysis buffer (10 mM Tris-HCl pH 7.4, 10 mM NaCl, 3 mM MgCl2) and incubated for 10 min on ice. IGEPAL CA-630 (Sigma) was added to a final concentration of 0.025% and the cell suspension was transferred to a 2 ml Dounce homogenizer. Nuclei were released by 15 strokes with the pestle. Success of lysis was confirmed by inspection under a light microscope. Nuclei were collected by centrifuging the cell suspension for 5 min at 800x g at 4 C and washed twice with cold lysis buffer without detergent. One million nuclei were resupended in reaction buffer to yield a suspension with a final concentration of 1x GpC MTase buffer (NEB), 0.32 mM S-Adenosylmethionine (SAM) (NEB), and 50 ul of GpC methyltransferase (4 U/ul)) from M.CviPI (NEB). The final reaction volume was 150 ul. The suspension was carefully mixed before incubating for 8 min at 37 C after which another 25 ul of enzyme and 0.7 ul of 32 mM SAM were added for an additional 8 min incubation at 37C. To avoid disruption of nuclei incubation was stopped by adding 750 ul of 1x PBS and collecting the nuclei at 800 xg. Supernatant was removed and nuclei were re-suspended in 500 ul 1x PBS containing Hoechst 33342 DNA dye (NucBlue Live reagent, Hoechst). Nuclei were kept on ice until sorting. For preparation of bulk libraries in GM21878 cell, nuclei preparation and GpC MTase treatment was performed as described above. Nuclei were lysed immediately after incubation and DNA was isolated using Phenol/Chloroform purification. Nuclei were sorted at the Flow Cytometry core at the University of Chicago on a BD FACSAria or BD FACSAria Fusio equipped with a 96-well-plate holder. To obtain individual and intact nuclei gates were set on forward and side scatter to exclude aggregates and debris. DAPI/PacBlue channel or Violet 450/500 channel were usedto excited the Hoechst 33342 DNA dye and to gate on cells with DNA content corresponding to cells in G1 phase of the cell cycle in order to maintain similar DNA content per cell and to remove potential heterogeneity attributable to cell cycle. Cells were sorted into individual wells pre-filled with 19 ul of 1x M-Digestion buffer (EZ DNA Methylation Direct Kit, Zymo Research) containing 1 mg/ml Proteinase K. Following collection, the plates were briefly spun to collect droplets that might formed during handling. Nuclei were lysed by incubating the samples at 50 C for 20 min in a PCR cycler. DNA was subjected to bisulfite conversion by adding 130 ul of freshly prepared CT Conversion reagent (EZ DNA Methylation Direct Kit, Zymo) to the lysed nuclei. Conversion was performed by denaturing the DNA at 98 C for 8 min followed by 3.5 hr incubation at 65 C. DNA isolation was performed using the EZ DNA Methylation Direct Kit (Zymo Research) following the manufacturer’s instruction with the modification that the DNA was eluted in only 8 ul of elution buffer. Libraries were prepared using the Pico Methyl-seq Library prep Kit (Zymo Research) following the manufacturer’s instruction for low input samples. Specifically, the random primers were diluted 1:2 before the initial pre-amplification step and the first amplification was extended to a total of 10 amplification cycles. Libraries were amplified with barcoded primers allowing for multiplexing. The sequences can be found in Supplementary file 1, primers were ordered from IDT. The purification of amplified libraries was performed using Agencourt AMPureXP beads (BeckmannCoulter), using a 1:1 ratio of beads and libraries. Concentration and size distribution of the final libraries was assessed on an Bioanalyzer (Agilent). Libraries with average fragment size above 150 bp were pooled and sequenced. Libraries were sequenced on Illumina HiSeq 2500 in rapid mode (K562 cells) and HiSeq4000 (GM12878 cells). Sequences were obtained using 100 bp paired-end mode. For processing and alignment each read from a read pair was treated independently as this slightly improved the mapping efficiency. Before alignment, read sequences in fastq format were assessed for quality using fastqc (http://www.bioinformatics.babraham.ac.uk/projects/fastqc/). Reads were trimmed to remove low quality bases and 6 bp were clipped from the five prime end of each read to avoid mismatches introduced by amplification. In the case of GM12878 cells 6 bp were clipped from either end of the read. Only reads that remained longer than 20 bp were kept for further analyses. These processing steps were performed using trim_galore version 0.4.0 (http://www.bioinformatics.babraham.ac.uk/projects/trim_galore/) with the following settings: trim_galore --quality 30 --phred33 --illumina --stringency 1 -e 0.1 --clip_R1 6 --gzip --length 20 -- output_dir outdir Sample.fastq.gz. The trimmed fastq files were aligned using the bisulfite aligner bismarck version 0.15.0 (Krueger et al., 2012) which calls bowtie2 (Langmead and Salzberg, 2012) internally. Reads were aligned to the human genome (genome assembly hg38). Reads were aligned in single read mode using default settings. The amplification protocol used to generate the scNOMe-seq libraries yielded non-directional libraries and alignment was performed with the option —non_directional (bismark --fastq --prefix SamplePrefix --output_dir output_dir -- non_directional --phred33-quals --score_min L,0,–0.2 --bowtie2 genome_file trimmed.fastq.gz). Some libraries contained small amounts of DNA from C. elegans as spike-ins, however these were not used during the analysis. Duplicates were removed using samtools version 0.1.19 (Li et al., 2009) on sorted output files from bismark (samtools rmdup Sample Prefix.sorted.bam Sample Aligned_rmdup.bam). Coverage and methylation status of all cytosines was extracted using bismark_methylation_extractor (Krueger et al., 2012) (bismark_methylation_extractor -s --ignore 6 --output outdir --cytosine_report --CX --genome_folder path_to_genome_data SampleAligned_rmdup.bam). The resulting coverage files were used to extract the methylation status of cytosines specifically in GpC and CpG di-nucleotides using the coverage2cytosine script which is part of Bismark (Krueger et al., 2012). The resulting coverage files contained cytosines in GCG context which are ambiguous given that they represent a cytosine both in GpC and CpG di- nucleotides. Coordinates of these ambiguous positions were identified using oligoMatch (Kent et al., 2002) and these positions were removed from the coverage files. The number of unconverted cytosines (estimated based on apparent methylation rates in non-GpC and non-CpG context) was low in all libraries (<1%). However, it was noted that unconverted cytosines were not randomly distributed but associated with entirely unconverted reads. Regions covered by a read with more than three unconverted cytosines in non-CpG and non-GpC context were removed from further analysis as well. The genotype was not taken into account as its effect on calling the methylation status incorrectly was deemed negligible for the analyses performed here. ScNOMe-seq data were compared to a number of genomic features in GM12878 and K562 cells collected by Encode (ENCODE Project Consortium, 2012) which were downloaded through the UCSC data repository (Karolchik et al., 2014). These datasets are listed in Supplementary file 1. While the scNOMe-seq data were aligned against human genome assembly hg38, some of the datasets were only available on genome assembly hg19 and the coordinates of these datasets were lifted from hg19 to hg38 using liftOver (Kent et al., 2002) (default re-mapping ratio 0.95). Nucleosome positions based on MNase-seq data in GM12878 were determined with DANPOS version 2.2.2 (Chen et al., 2013) using default settings. Resulting intervals were lifted to hg38. After removing summit locations with occupancy values above 300, the top 5% (713361) of nucleosome positions based on their summit occupancy value were used. GpC and CpG methylation density across intervals encompassing DNase hypersensitivity sites (DHSs), transcription factor binding sites (TFBS), and well positioned nucleosomes was calculated across the 2 kb regions centered on the middle of these regions using the scoreMatrixBin function in the genomation package (Akalin et al., 2015) in R (R Core Team, 2015). Data were aggregated in 5 bp bins for each region and across all regions covered in a single cell. The average methylation level in pre-defined intervals (DHSs, TFBS) was determined by computing the average GpC or CpG methylation for each interval together with the number of GpC/CpGs covered in this interval using the map function in bedtools (Quinlan and Hall, 2010). If no other cut-offs were given, DHSs were considered ‘covered’ and used in analyses when at least 4 GpCs occurring within the predefined interval were covered by sequencing data in an individual cell. Because the frequency of CpG di-nucleotides is significantly lower, only 2 CpGs were required in order for a DHSs to be considered covered for analyses that focused on endogenous DNA methylation. To count the number of cytosines within the primary sequence of a given DHSs only cytosines on the forward strand were counted. While each GpC dinucleotide can be measured on both strands and would therefore yield a count of two cytosines the data are sparse and each location will get at most a single read. This approach should therefore give a more conservative estimate of the possible GpC coverage. For analyses that used the scores of the peak regions, the peak scores reported the datasets from bulk samples were used (ENCODE Project Consortium, 2012). For analyses that were centered on transcription factor binding motifs the PWMs were obtained from the JASPAR database (Tan, 2014) (Tan) for the TFs CTCF (MA0139), EBF1 (MA0154), and PU.1(MA0080). Genome-wide scanning for locations of sequence matches to the PWMs was performed using matchPWM in the Biotstring package (Pages et al., 2016) in R with a threshold of 75% based on the human genome assembly hg38. All plots were prepared using ggplot2 (Wickham, 2009), with the exception of heatmaps displaying the average methylation density around genomic features in individual cells which were prepared using heatmap.2 in gplots (Warnes et al., 2016). Similarity in accessible chromatin between cells was calculated based on Jaccard similarity. Jaccard similarity index (Equation 1) was calculated between pairs of samples by first obtaining the intersection of DHSs covered in both samples of a pair with more than 4 GpCs. Each feature was annotated as open or closed, depending on the methylation status (> = 40% methylation) and only pairs in which at least one of the members was open were considered for this comparison. The similarity between samples from GM12878 and K562 cells was calculated based on the union set of DHSs from both cell lines. The similarity indexes of all pairwise comparisons were used to compute the distances between each cell. The resulting clustered data were displayed as a heat map. CTCF footprints were measured by comparing the GpC methylation level in each motif to the methylation level in the 50 bp flanking regions immediately upstream and downstream of the motif. Overlapping motifs were merged into a single interval before determining the coordinates for flanking regions. To ensure sufficient GpC coverage for each interval the resulting three adjacent intervals for each locus were required to contain at least one covered GpC each, and four covered GpCs in total. This analysis only included regions that were accessible based on the methylation status of the flanking regions (at least 50%). A CTCF 'footprint score' was determined by simply subtracting the average GpC methylation of the flanking regions from the GpC methylation of the motif. scNOMe-seq data were displayed in the UCSC genome browser (Kent et al., 2002) by converting the GpC methylation coverage file into a bed file and using the methylation value as score. To facilitated the visualization of the data in the context of previous Encode data the methylation files were lifted to hg19. The tracks shown together with scNOMe-seq data are Open Chromatin by DNaseI HS from ENCODE/OpenChrom (Duke University) for DNaseI hypersensitivity, Nucleosome Signal from ENCODE/Stanford/BYU, and CTCF ChIP-seq signal from Broad Histone Modification by ChIP-seq from ENCODE/Broad Institute. All data are from GM12878 cells. Nucleosome phasing estimates were obtained by first calculating the correlation coefficients for the methylation status of pairs of GpCs ad different offset distances. These values were computed using a custom python script (Source code 1 – NucPhasing.py). Essentially, pairs of sequenced cytosines in GpC di-nucleotides were collected for each offset distance from 3 bp to 400 bp cytosine. At each offset distance the correlation of the methylation status was calculated across all pairs. Correlation coefficients were plotted against the offset distances revealing periodic changes in the correlation coefficient. The smoothened data were used to estimate the phasing distances by obtaining the offset distance corresponding to the local maximum found between 100 bp and 300 bp. 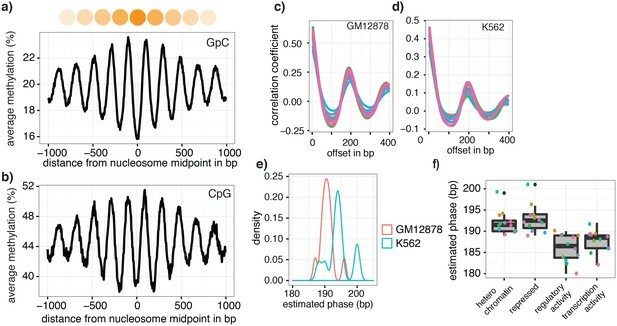 To determine phase lengths of nucleosomes in different chromatin contexts the GpC coverage files were filtered for positions falling into categories defined by chromHMM (ENCODE Project Consortium, 2012; Ernst et al., 2011) before obtaining the correlation coefficients. Raw data and methylation coverage files are available at GEO (https://www.ncbi.nlm.nih.gov/geo/) under the accession number GSE83882. Current Protocols in Molecular Biology 109:21.29.1–21.29.9. Current Protocols in Molecular Biology Chapter 21:Unit 21.17.1–21.1716. Biostrings: String Objects Representing Biological Sequences, and Matching Algorithms. Springer Science & Business Media, New York. Thank you for submitting your article "Simultaneous measurement of chromatin accessibility, DNA methylation, and nucleosome phasing in single cells" for consideration by eLife. Your article has been favorably evaluated by Aviv Regev (Senior Editor) and three reviewers, one of whom, Bing Ren (Reviewer #1), is a member of our Board of Reviewing Editors. This manuscript presents a novel genomic technique single-cell NOMe-seq that allows the simultaneous measurement of DNA methylation and chromatin accessibility. Applying scNOMe-seq to GM12878 and K562 cell lines, the author provides evidence that scNOMe-seq can potentially distinguish between cell types, reveal chromatin accessibility and TF binding events, and inform about nucleosome phasing in single cells. While all three reviewers recognize the novelty of the method, they all raised concern regarding the utilities of scNOMe-seq, and lack of novel biological insights. To strengthen the work, the author would need to carry out in depth analysis of the datasets, and expand the analyses to additional cells. The essential revisions are comprehensive and may take some time to complete. Please let us know how you plan to respond to the concerns below and provide an estimate of the time it will take to do so. 1) Much of the analyses presented in this manuscript are meta-analyses, where either multiple cells are grouped together or similar genomic features are grouped together. While such analysis is important to show that the data are consistent with bulk NOMe-seq, it does not convey the true utility of single-cell NOMe-seq. To demonstrate the utility of this method over state of art single cell technique, the author needs to carry out additional analysis, such as identifying accessible chromatin regions from scNOMe-seq data, and carrying out systematic comparison to existing methods. 2) Better characterize the cell to cell variability of chromatin accessibility as identified from scNOMe-seq datasets. As pointed by reviewer #2, the finding of viability of chromatin accessibility between cells is not surprising nor novel. To gain novel biological insights, additional datasets from substantially more cells may need to be generated and analyzed. 3) Fuller analysis of CpG methylation should be performed to illustrate the benefits of simultaneous measurements of accessible regions and DNA methylation in the same cells. 4) Better documentation of sensitivity and specificity of the method, as pointed out by reviewer #1. In this manuscript by Pott, the author reported a new method to simultaneously profile chromatin accessibility and DNA methylation in single cells. The method is a clever adaptation of an exciting method NOME-seq, which combined de novo GpC methylation and whole genome bisulfite sequencing to determine the nucleosome positions in the genome. The author provided proof of principle by carrying out NOMe-seq in single GM12878 and K562 cells. The author showed that scNOMe-seq could reveal chromatin accessibility as reads with methylated GpCs at DNase hypersensitive sites, and uncover cell to cell variability of the chromatin accessibility. He also showed that the method could reveal footprints of transcription factor binding such as CTCF in individual cells. Finally, he provided some evidence that nucleosome spacing could be inferred from the single cell NOMe-seq data. Overall, the author provided preliminary data to support the feasibility and utilities of the scNOMe-seq method. Important concerns with some technical aspects of the work will need to be addressed before it could be considered as suitable for publication. 1) The author stated that scNOMe-seq allows measurement of chromatin accessibility. This statement is supported by the observation that DNaseI hypersensitive sites mapped from bulk cell population showed increased levels of GpC methylation in single cells. However, the author has yet to provide data on sensitivity and specificity of scNOMe-seq in mapping accessible chromatin regions. From the scNOMe-seq datasets, it is not clear how the accessible regions can be identified. Data analysis method finding such regions is missing. Also lacking is a systematic comparison of the accessible regions identified by scNOMe-seq and DHS mapped from bulk data. 2) The author observed that many DHS show 50% GpC methylation, and concluded that this indicates cell to cell variability of chromatin accessibility. While this is certainly a plausible explanation, the author needs to rule out the possibility of incompleteness of the GpC methylation reaction. In other words, the author needs to document the sensitivity (or false negative rates) of the assay. For example, he could examine the GpC methylation rate at a number of positive control regions where chromatin accessibility should exist in all cells, and use the result to determine the completeness of the GpC methylation reaction. 3) The author stated that "scNOMe-seq detected CTCF DNA binding events from single cells". Again, similar to point #1, this is an overstatement. The author has failed to demonstrate that scNOMe-seq data lead to identification of CTCF binding in individual cells. Aggregate analysis over many CTCF binding sites identified from bulk ChIP-seq data does not go far enough. It is yet not clear how sensitive and specific scNOMe-seq datasets could allow one to map CTCF binding events in single cells. 4) In Discussion, the author stressed advantages of scNOMe-seq over other single cell techniques, but failed to describe some obvious limiting factors, such as restricted scope of analysis (limited to regions with GpC), costs of analysis, number of cells that could be profiled, etc. In this manuscript, Pott presents single-cell NOMe-seq, a genomic technique that allows the simultaneous measurement of DNA methylation and chromatin accessibility. The author applies scNOMe-seq to GM12878 and K562 cell lines. The analyses show that scNOMe-Seq recapitulates results from bulk NOMe-seq, that scNOMe-seq can distinguish between cell types, that scNOMe-seq can reveal TF footprinting in single cells, and that scNOMe-seq can inform about nucleosome phasing in single cells. One of the main benefits of scNOMe-seq is the ability to distinguish drop-out events from false negatives, thus allowing a truer single-cell representation than existing single-cell chromatin accessibility methods such as ATAC-Seq. However, this comes at the cost of having to sequence much deeper, and this prohibitive cost could limit the adoption of the scNOMe-seq. My assessment is that the method is a novel advance. However, the analyses presented here do not convincingly show how the scNOMe-seq is of much greater utility than existing methods. In addition, the current manuscript is lacking in new biological insights. 1) Much of the analyses presented in this manuscript (most of Figures 1–2 and 4, some of Figure 3) are meta-analyses, where either multiple cells are grouped together or similar genomic features are grouped together. While such analysis is important to show that the data are consistent with bulk NOMe-seq, it does not convey the true utility of single-cell NOMe-seq. 2) The author writes that scNOMe-seq "provided direct evidence for the notion that the degree of DNaseI accessibility observed in DNase-seq of bulk samples reflects the frequency with which a particular region is accessible in individual cells." While this statement is true, it is not entirely novel as the same conclusion could be made from bulk NOMe-seq. Since bulk NOMe-seq gives an absolute measure of CpG and GpC on a scale from 0% to 100%, its measurement gives an estimate of the number of cells in the population that have a CpG or a GpC. 3) Perhaps part of the reason that the manuscript does not reveal new biological insights is that too few cells were analyzed, and the coverage per cell is too low. For example, having enough cells would allow the author to address questions of single-cell heterogeneity. 4) The author spends the vast majority of time analyzing scNOMe-seq for chromatin accessibility. But one of the main utilities of this method is the ability to examine single cell DNA methylation. A fuller analysis between the interplay of DNA methylation and chromatin in single cells could add substantial novelty to the manuscript. The author presents a single-cell version of NOMe-seq, a previously described method that provides simultaneous DNA accessibility and DNA methylation measurements. The single-cell version of this method presented here uses FACs sorting of nuclei and Illumina sequencing in a 96-well format, with results presented from libraries derived from 23 nuclei representing two different lymphoid-der cell types. This is a proof-of-principle exercise, and not intended to break any new ground with respect to biological insights. The analyses are sufficiently thorough to demonstrate that scNOMe-seq results are consistent with results using the original bulk version. The data are impressively clean and the efficiency is quite good considering the inherent sparseness of the single cell approach and the deleterious effects of bisulfite treatment of DNA. I have no technical concerns. The key question in my mind is whether there is likely to be sufficient interest in this tool from readers of eLife to qualify as a Tools and Resources article, which must be "especially important" for the field and have "the potential to accelerate discovery". Bulk NOMe-seq is already a single-molecule method, in that each read represents a short snippet of a single genome from a single cell. Single-cell methods for measuring DNA accessibility alone are already relatively mature, in some cases allowing for orders-of-magnitude more single cells to be profiled than using scNOMe-seq, for instance using ATAC-seq with barcoding or microfluidics strategies (Cusanovitch 2015 and Buenrostro 2015 cited). Another method allows for whole-genome bisulfite sequencing of single cells (Farlik 2015 cited). Admittedly these methods do not provide simultaneous DNA accessibility and methylation information, but the inherent sparseness and small scale of the method, and the ambiguity caused by diploidy as to which genome in the cell is being profiled, would seem to limit the range of questions that scNOMe-seq can uniquely address. The author shows that the two different cell types can be distinguished (although it is possible that this a batch effect) but in the realm of sorting cell types from a mixture, or estimating cell-type heterogeneity, scRNA-seq should continue to dominate. scRNA-seq has the advantage over scNOMe-seq of measuring nucleic acids that the cell has amplified by transcription, so that the sparseness of gene-specific products is much less of an inherent limitation than when there are only 2 copies of each DNA duplex in a cell. If there is some real-life situation in which someone would prefer to use this method as opposed to others already available for DNA accessibility mapping and DNA methylation profiling, then I would be more enthusiastic. […] While all three reviewers recognize the novelty of the method, they all raised concern regarding the utilities of scNOMe-seq, and lack of novel biological insights. To strengthen the work, the author would need to carry out in depth analysis of the datasets, and expand the analyses to additional cells. The essential revisions are comprehensive and may take some time to complete. Please let us know how you plan to respond to the concerns below and provide an estimate of the time it will take to do so. I would like to respond to this point first, before responding point-by-point to the reviewers’ comments. Thus far, few methods have been established for measuring single cell chromatin organization in single cells and none of them are widely used yet. These methods are adaptations of commonly used approaches in which read counts constitute the signal (except for bisulfite sequencing). This can be problematic on the level of individual cells where such count-based signals appear binary and very sparse. To complement these assays, it is therefore important to develop additional methods that provide information on chromatin organization using orthogonal approaches. In this context, I believe that scNOMe-seq will be an important addition to the set of single cell genomic methods. However, NOMe-seq had not been used as widely as, for example, ATAC-seq and DNase-seq, and a detailed proof-of-principle study was needed to gauge it suitability for this task. This study was primarily designed to test whether scNOMe-seq captures observed bulk features in single cells. As such this study is limited to providing evidence that scNOMe-seq data recapitulate observations in single cells that were previously made in bulk samples. This study confirms that scNOMe-seq indeed measures chromatin accessibility and DNA methylation in single cells. The revised manuscript also includes a more detailed analysis of GpC and CpG methylation within and around genes. I believe that the data presented in this manuscript make a strong case for a wider application and encourage other researchers to apply scNOMe-seq in their single cell studies. As discussed above, this study is intended to provide proof-of-principle that scNOMe-seq can measure chromatin accessibility and endogenous methylation simultaneously in a single cell. The data demonstrated that scNOMe-seq qualitatively recapitulates chromatin accessibility and CpG methylation characteristic for a range of genomic features. Like analyses for single cell ATAC-seq, these analyses relied on previously annotated regions. Because the coverage is very sparse it is not possible to call accessible regions within single cells. I agree with the comment; these results are indeed what is expected and it is therefore an important confirmation of the method’s ability to measure chromatin accessibility. As pointed out by the reviewer, this study does not use enough cells to gain novel biological insights into cell-to-cell variation in chromatin accessibility. This study was designed as a proof-of-principle study, while it would have been desirable to also have novel biological insights this is not feasible with the limited set of cells and beyond the scope of this study. A fuller analysis of endogenous CpG methylation has now been included. This includes direct comparison between GpC and CpG methylation within DHS and includes the use of CpG methylation to separate individual cells by cell type (i.e. GM12878 and K562). The manuscript now includes a more direct assessment of the sensitivity and specificity. Figure 2 and Figure 2—figure supplement 7 and 8 include comparisons between GpC methylation in DHS to randomized DHS. These analyses show that GpC methylation is strongly enriched in DHS (even those with very low scores) compared to random locations. They also show that the correlation between GpC methylation levels and peak scores in individual cells is completely lost when the regions are randomized. […] Important concerns with some technical aspects of the work will need to be addressed before it could be considered as suitable for publication. As discussed above, this study is intended to provide proof-of-principle that scNOMe-seq can measure chromatin accessibility and endogenous methylation simultaneously in a single cell. 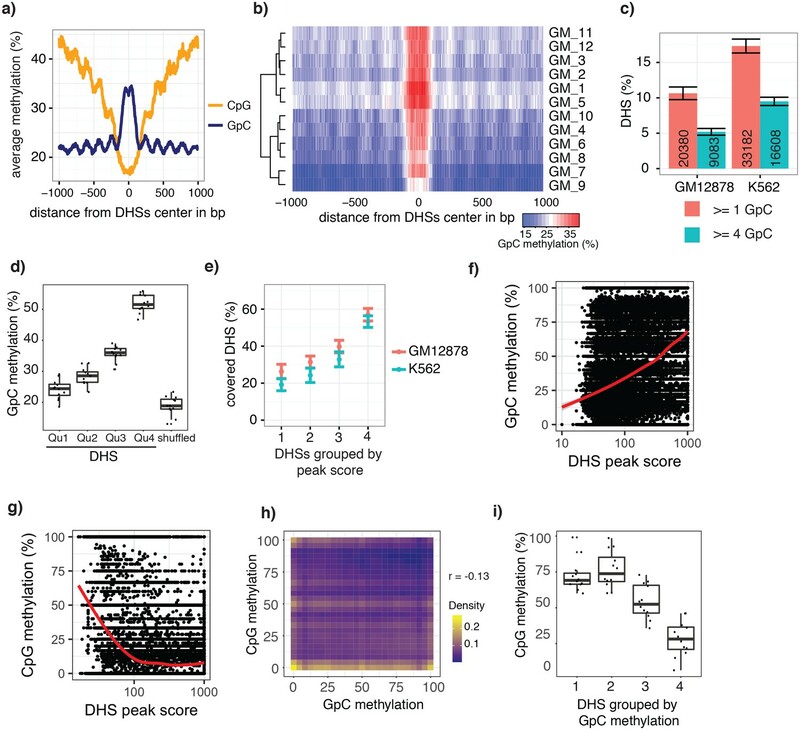 The data demonstrated that scNOMe-seq qualitatively recapitulates chromatin accessibility and CpG methylation typically associated with genomic features. Like analyses for single cell ATAC- seq, these analyses relied on previously annotated regions. Because the coverage is very sparse it is not possible to call accessible regions within single cells. Higher coverage per cell will overcome this limitation to some degree. I agree with the reviewer that the absolute GpC methylation level might be affected by the completeness of the methylation reaction. Given this experimental set up it is not possible to resolve this entirely. In relative terms the data provided in Figure 2 and Figure 2—figure supplement 7, 11 does indicate that the methylation rate increases with a measure of DNase- seq based chromatin accessibility (peak scores). Higher cell-to-cell variability is associated with regions with lower DHS score and thus not randomly associated with sites that went unmethylated. A more thorough discussion of these considerations has been included in the paper. […] My assessment is that the method is a novel advance. However, the analyses presented here do not convincingly show how the scNOMe-seq is of much greater utility than existing methods. In addition, the current manuscript is lacking in new biological insights. As discussed above, I agree with the reviewer that this is a limitation of the study. However, I argue that establishing the scNOMe-seq assay and demonstrating that this method captures features of chromatin organization observed in bulk through various methods is an important advance that will motivate additional studies. The reviewer is correct in pointing out that these measurements (like those obtained from conventional bisulfite sequencing) are single molecule methods and each fragment therefore represents a measurement from a single cell. However, there are many situations in which a population measurement is not informative (or less informative than data obtained from individual cells). For example, scNOMe-seq will be a useful application to characterize cells in heterogeneous mixtures like brain tissue. While performing bulk NOMe-seq would provide a precise measurement of the average accessibility and DNA methylation at a particular locus, in these samples it would reflect the average measurement of the heterogeneous population. Using scNOMe-seq it would be possible to first group cells based on their similarity (e.g. use GpC or CpG methylation) and then compare the GpC methylation/chromatin accessibility between groups. This analysis is not possible in bulk using bulk NOMe-seq. The limited number of cells analyzed, the collection of cells in the G1 phase, and the sparse coverage make it difficult to address questions of cellular heterogeneity using these data. As discussed above this study was designed to provide proof-of-principle that NOMe-seq can be applied to single cells. Addressing the question of single-cell heterogeneity is the express motivation behind the development of this approach, but beyond the scope of the current study. The reviewer highlights an important point. The initial manuscript focused almost exclusively on chromatin accessibility. A more detailed analysis of CpG methylation has been included as well as a direct comparison of GpC and CpG methylation at individual DHS. […] The key question in my mind is whether there is likely to be sufficient interest in this tool from readers of eLife to qualify as a Tools and Resources article, which must be "especially important" for the field and have "the potential to accelerate discovery". Bulk NOMe-seq is already a single-molecule method, in that each read represents a short snippet of a single genome from a single cell. Single-cell methods for measuring DNA accessibility alone are already relatively mature, in some cases allowing for orders-of-magnitude more single cells to be profiled than using scNOMe-seq, for instance using ATAC-seq with barcoding or microfluidics strategies (Cusanovitch 2015 and Buenrostro 2015 cited). Another method allows for whole-genome bisulfite sequencing of single cells (Farlik 2015 cited). Admittedly these methods do not provide simultaneous DNA accessibility and methylation information, but the inherent sparseness and small scale of the method, and the ambiguity caused by diploidy as to which genome in the cell is being profiled, would seem to limit the range of questions that scNOMe-seq can uniquely address. The author shows that the two different cell types can be distinguished (although it is possible that this a batch effect) but in the realm of sorting cell types from a mixture, or estimating cell-type heterogeneity, scRNA-seq should continue to dominate. scRNA-seq has the advantage over scNOMe-seq of measuring nucleic acids that the cell has amplified by transcription, so that the sparseness of gene-specific products is much less of an inherent limitation than when there are only 2 copies of each DNA duplex in a cell. If there is some real-life situation in which someone would prefer to use this method as opposed to others already available for DNA accessibility mapping and DNA methylation profiling, then I would be more enthusiastic. I thank the reviewer for these comments. The reviewer correctly pointed out that this is a proof-of-principle study and the data are not providing biological insights. I believe that scNOMe-seq has the ‘potential to accelerate discovery’ and that presentation of these data will encourage further studies using this method. One interesting application for scNOMe-seq would be the identification and characterization of epigenomic subtypes in cells within complex tissues. One approach could be to first use the endogenous CpG methylation to group cells based on their ‘epigenetic’ make up and then to combine the information of all cells within a given group to obtain rich cell-type specific datasets on chromatin organization and DNA methylation. The author declares that there was no funding for this work. I would like to thank Yoav Gilad for support, and Greg Crawford and colleagues in the Department of Human Genetics for helpful suggestions and comments on the manuscript. Cell sorting was performed by M. Olson and D. Leclerc at the Flow Cytometry core of the University of Chicago. I am grateful to Jason Lieb for his input and support at the beginning of this project. © 2017, Pott et al.